Like the butter cake recipe below, this is my version (barely modified) of a frosting recipe I found online at http://www.joyofbaking.com. Yesterday, I added a natural food coloring to bring the icing to a light lemon yellow color. Today, I am adding 1/2 c. cocoa powder in place of 1/2 c. of the confectioners’ sugar (which is the same as powdered sugar and is defined by the addition of corn starch to sugar). Cream the butter and cream cheese together in a stand mixer until smooth with no lumps. Scrape down the sides of the bowl. Add the vanilla extract. Add the powdered sugar a bit at a time, scraping down the sides. If you want to include zest, add the zest. Beat on high speed until the frosting is light and fluffy. On this cake, the middle layer is heavy cream (unmeasured – I did it by sight) whipped with about 1/3 c. sugar into a whipped cream, with a sprinkling of mini chocolate morsels. When I put the cakes in the freezer to prep for frosting, I took out some fresh strawberries, washed them well, sliced them then put them in a lidded container with about a tablespoon of sugar to let them macerate. When it came time to frost the cake, I put the strawberries down in circles covering the entire first layer. 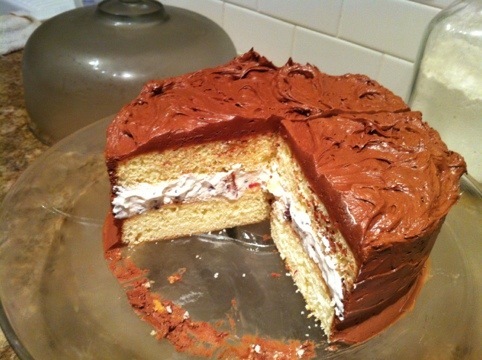 I then topped that with a generous layer of whipped cream. 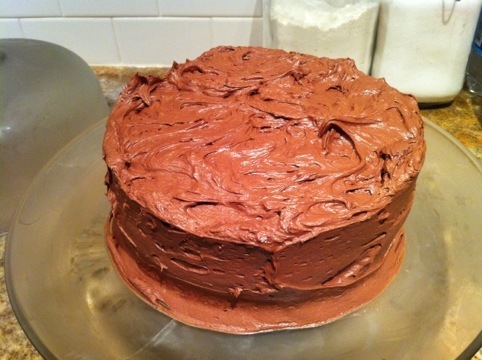 After putting on the second layer cake, I frosted the entire thing with the cream cheese and cocoa frosting. And, voila..
CRUEL- my trusty Jeep’s front axle was in need of repair before vehicle and front wheel parted ways. UNUSUAL- the mechanic called earlier than the usual 6:00 PM to say everything was back in working order. PUNISHMENT- after transplanting most of my starter plants into the ground, coffee in hand, logging in to Revel Gardener and seeing pictures of that wonderful looking cake covered in chocolate frosting- and not having a piece! Too funny! Sorry, didn’t mean to tease. I will happily trade you chocolate for grass clippings. Meant to tell you before to feel free to send any email to revelgardener@gmail.com (set it up specifically for this site). I almost mowed the back before but decided to wait a day or so. I’ve never intentionally made a compost pile so whatever I may know is based on ….. podcasts of cause. I heard if a compost pile doesn’t reach 160 degrees (if I remember) it will not kill seeds in it, and I am guessing since yours is wet that it is not too warm. Clippings from my yard have grass, clover, wild violets, dandelions, and whatever else happened to like the neighborhood- but no pesticides. My guess is that once mowed it may fill one bag, possibly less. I drop it in place since I don’t plant in that area yet and the weeds help break up my clay/ soil. If you don’t mind the weed seeds let me know and I’ll put the clippings on the side.